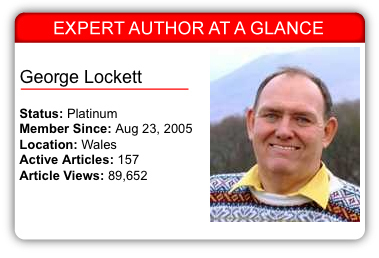 Today’s Expert Author Case Study introduces us to George Lockett, an Expert Author with over 30 years of experience in the personal development niche and who is currently focused on meditation, yoga and spiritual healing. George channels his own source energy and his understanding of the interconnectedness of the world to share his knowledge. His positive attitude keeps him inspired and acts as a source of creativity for writing. He also used that inspiration to write the book A Journey Into the Self: The multi-dimensional nature of being human. For George, article writing and marketing is a way to share his expertise with a growing number of people who look to the Internet first for answers. As a part of our ongoing Expert Author Case Study project, we asked George to share his own thoughts on article writing and marketing. I think it’s my deep understanding of spirit and self. After 35 years of practicing and studying yoga and meditation, I make a good connection to my own source energy. I write when I’m inspired and have something useful to say. I enjoy writing to share my knowledge and unique way of seeing the world. I feel I’m almost in a different dimension than most people who I meet and interact with. Though I realize we are all one and connected to each other on many different levels; including through EzineArticles. I choose to be in a good mood and happy each day. I don’t make my happiness dependent on what is happening in my life. I find happiness helps to inspire me and to come from one’s own source of creativity and love, deep within the heart. I write about things I’m interested in, knowing that we are all one. So if I am interested in what I write, I know my readers will also be interested. I choose to write for quality and know that if I do this, a little and often, that the quantity will build up over time. I think it’s more important to write inspiring articles with useful information. Quality and purpose are more important to me. I am receiving many clicks to my website from EzineArticles each month and notice that a lot of the traffic stays quite a while and looks at many of the nested pages, too. People do research and go deep into the site, using the many resources there. I use EzineArticles as a subtle form of marketing/advertising, getting myself to be a household name, where people turn to for information and advice. I notice that a lot of people visiting my website go on to request healing or purchase my book. I like the RSS Feeds and XML. It’s helpful to know that when people choose to watch my RSS Feed, they receive my new articles automatically. I also have the RSS feed on my website, so it updates automatically when I publish a new article with EzineArticles. I would have all my articles proofread professionally before publishing. The quality of my work has improved, as I have become more professional. Though, some of the earlier articles may benefit from being proofread and reworked with my current understanding of life and living. I would suggest just starting from where you are now. Don’t be critical of yourself and your writing. Just let it flow and get it on paper/computer. Check it a few days later and adjust. Then, upload it to the EzineArticles website for publication. EzineArticles has also been evolving and will let newbies know what is needed to bring their article up to a professional standard. Working as a team, we can achieve much more than by ourselves. I find the EzineArticles team very professional and helpful. I know they are always looking for new ways to be innovative and creative in their approach to expanding EzineArticles, which has become a major knowledge base in the world. Stay Positive – Starting the day off in a positive mood is the first, and sometimes most important, step to a productive writing session. Be positive and happy about your ability to share great content. That happiness will translate in your writing. Negativity, on the other hand, can really slow you down and prevent you from reaching your goals. Try Incorporating RSS – With RSS feeds, the content becomes available automatically for people interested. You can also incorporate it into your website and show visitors your published article inventory. Don’t “Second Guess” Yourself – If you are too critical of your ideas before they even have a chance to get down on paper, think of the tough time you’ll have in writing 5, 10, 50 or more articles. When you “second guess” an idea, you are stopping it dead in its tracks and giving yourself more work than you need. Let it Flow – Get your ideas down, then give yourself some time to step away from each article. This will give you a chance to see your writing with a fresh and open mind. When you become too involved in rewriting and revising without that break, you’re probably not going to make as much progress as you’d like. Write When Inspired – We all have those “Ah-ha!” moments from time to time. Use them to the best of your ability. Have a notepad of some type nearby at all times so that when these moments happen, you are prepared and ready to harness the energy of the idea and turn it into an article or set of articles. Use these quick tips to write and submit your next set of high-quality, original articles. Also, leave a comment for George and share one of your own tips. Thank you George, I am on the first wrung of the ladder towards my own writing from my spirit and find your writing on this matter very comforting. I can fully comprehend where you are comming from. This has encouraged me to keep going along your same lines. You have shown me, with all of your experience in writing articles, you can keep it very easily understood even for a newbie such as myself. George, thanks for your tips to help me get the cobwebs out of my head. As a new author, I really like when I get an idea, and I am able to run with it. Keep giving us good feedback, we appreciate it! Great sharing, George, You inspires me much in writing inspiring articles, not with those boring ideas. Thanks for your tips. I will try and hope to enjoy more ideas. Great tips, George, you inspires me much on how to write high-quality articles. Thanks for your sharing. This was great information! Especially your tip about keeping a notepad ready for when inspiration and those “Ah Ha” moments come. This is where my Blackberry comes into play. Thanks to the Notepad feature on there, I’m able to write articles on the fly. I love it! As far as spiritual healing goes, does that imply reincarnation, creationism, or evolution? My idea of a 1st order question is: where does someone go when they die? Hello George… Point no. 5 is the one that I liked best… Good luck with your future writing. Thanks for your sharing of ideas about article writing. I started to writing article related to my website about affiliate marketing. You points out that really true of the quality content is needed for your writing. Content is the king forever, and what you wrote about you are interested in and it can share your thinking on your interest with people would let you happy, I think. Thanks for your sharing, you give me a light. I will keep going on article marketing. I really enjoyed reading your Case Study, writing when I feel inspired is something that I will make sure I will do more. I often don’t enjoy the task of writing articles, not sure why that is, self doubt perhaps. I will wait for the a-ha moments now. Good luck with your future goals and aspirations, Alex. very nice articles.thanks for sharing information. Thank you all for the wonderful comments and waves of appreciation for my work. George, as someone who’s just starting out, I have to say, THANK YOU. After reading your blog, I’m now going to check out your articles. I’ve published 2 articles with EzineArticles and, after your inspirational thoughts, I look forward to more when I get my “aha” moments. Hello I didn’t understand : how to incorporate RSS Feeds in your articles ? How can I do this ? thus I try to use RSS Feeds but don’t know how , where and when ? you have to be relax and happy before you start writing the article. And I also agree with your “let it flow” concept. I find myself writing better articles when just write whatever comes to my mind and edit it later. what a great info . about the thinking power . i agree that we have to choose things that make us to be happy. great tips . my best wishes for the eve of Christmas. Thanks for sharing such a nice information this really inspire me to write the high quality article.. Thank you everyone for the continued comments and inspiration. I have been doing other things recently, but now intend to get back into article writing.